Everyone who’s been grabbing the $99 and $149 HP TouchPads in the recent fire sale might not be stuck with HP's webOS. Two TouchPads recently purchased appear to run the Android OS. Owners of these oddball TouchPads claim to have bought their tablets shipped with the Android OS already preloaded. Photos purporting to be of one of these Android HP TouchPads are now on eBay and show the discontinued HP tablet running Android version 2.2.1. As of 2 p.m. EDT, the current bid for purchase of the tablet was $810, with 16 bidders participating. That's expensive for an Android tablet, especially for one that would cost you $149 without Android--if you could find one. However, the Android build is a rarity. 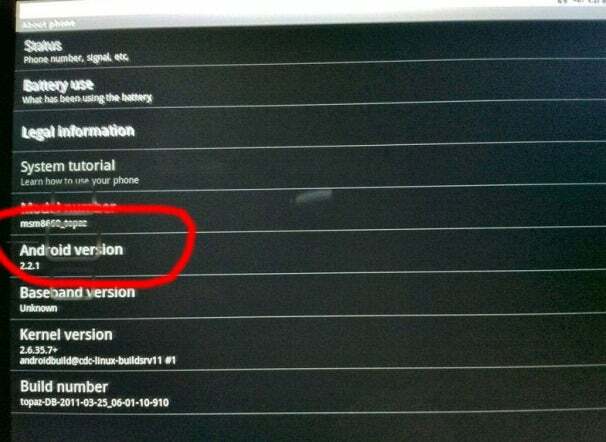 Screenshot supposedly taken from HP TouchPad running Android OS that is now for sale on eBay. The owner of the other Android TouchPad performed a system dump of the tablet and shared the software with the coders at RootzWiki. The race is on to see if they can break the code to find out how to port the Android operating system to all the other (attractively priced) TouchPads.